One of the first accounts of a “thinking horse” must have been that of Marocco (c. 1586 – c. 1606). Marocco also known as Bank’s Horse was owned by William Banks, and was said to posses the ability (amongst others) of stomping-out, with his forefoot, the amount of change in onlookers’ pockets. Needless to say that in those dark ages in which they lived, their uncanny abilities led them to be burnt at the stake, together, by superstitious town folk. But Bankes, who taught your horse to smel a knaue? Karl Krall & the horses of Elberfeld, Germany. 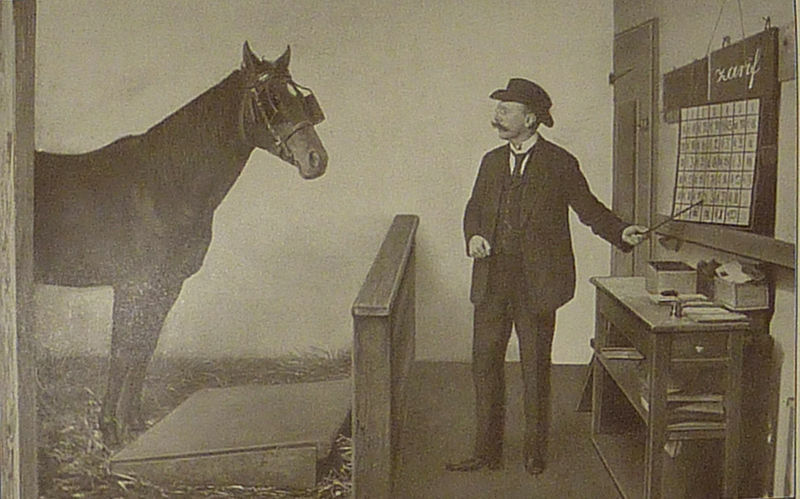 In the years following the scientific investigation of Clever Hans in 1904 (previous article: Hans the wonderhorse), the “thinking horse” paradigm was greatly affected by the unexpected conclusions drawn, and many of those that claimed abilities for their animals fell into disrepute. In 1905, the owner of Hans, Wilhem von Osten, met the jeweller Karl Krall, marking the beginning of extended collaborations between both men. Krall had taken a great interest in Von Osten’s labours, and during the years that followed, had eagerly accompanied and on occasion directed, the education of the clever stallion. Karl Krall believed in the sincerity of von Osten’s claims to Hans‘ intelligence, despite the rulings of the scientific commission. He purchased two horses: Muhamed and Zarif in order to educate them following the lead of von Osten’s method. It was also in the stables of Krall, that an agingHans lived the remainder of his days, after the passing of von Osten in 1909. Muhamed, was reportedly able to mentally extract the cube roots of numbers, which he would then tap out with his hooves. He was also reported to play music. A number was written on a blackboard, Muhamed was then asked to extract its cube root. His left foot represented the tens, while his right foot represented the ones, so that in order to give the answer seventy-seven, he would tap seven times with his left foot and seven times with his right. Karl Krall wrote a book about his methods and the abilities of his horses entitled “Denkende Tiere” (Leipsig, 1912) which translates to; Thinking Animals. The book caused a veritable storm of comment, criticisms and explanations which eventually led to the assembly of yet another scientific inquiry. Krall, never doubted that his horses could solve problems for themselves, without any form of assistance, without outside influence, simply by their own mental prowess, the most arduous of questions posed. He was persuaded that they understood what was said to them and what they said in return, in short, that their brain and their will perform exactly the same functions as ours. To investigate the validity and genuineness of Krall’s claims, a Scientific commission comprised of several doctors and psychologists from many countries, was set-up. Krall invited these investigators to witness the daily lessons afforded the horses, so they could document and test the his methods of instruction, and the horse’s remarkable abilities. The results of the Hans Commission hung heavy in the minds of most of the investigators in the scientific inquiry. Were these horses too responding to subtle involuntary bodily cues given-off by the questioners? Scientists vsisted the Elberfeld horses one after the other, and their reports became legion. Learned men of every country visited and passed verdict on the abilities of Kralls horses, like a scientific ‘who is who’ parade. Krall’s stable at the time of the conmotion, contained 8 horses including the 16 year old Clever Hans; Zarif and Muhamed, Little Hans, Amasis,Haroun, Bento (A blind horse), and a small pony: Hanschen. The first demonstration was in benefit of Dr. Edward Claparede, who was presented with Amasis, one of Krall’s newer horses who had only undergone 5 weeks of instruction. Three wooden pegs were layed in front of the horse, three other pegs were also layed together in another group and a card bearing the plus (+) sign separated the two groups of pegs. At the right of this set-up, a card with a large number 6 was placed. Krall counted to six aloud andAmasis would tap with his right foot, in consonance with the counting. 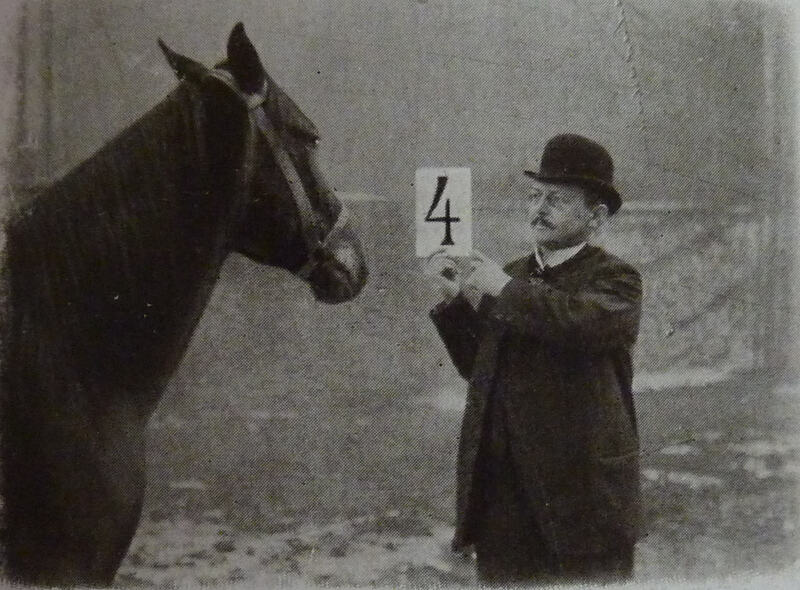 The same procedure was repeated in front of a blackboard, and instead of pegs bars were drawn: (III + III =6) or just numbers (3+3=6), and again each time Krall counted-out, the horse would synchronously tap with his forefoot. Zarif was later brought in, showing clear signs of having been instructed for a far longer time. Kral demonstrated Zarif’s knowledge of the French language, much to Dr. Claparède’s and the rest of the commission’s amazement. Then it was the turn of livelier Muhamed, the mathematical genius, who seemed at times to offer the wrong answer only to vex Krall. Even the blind horse, Bento, who obviously could not receive visual signals, was able to solve the more simple mathematical problems to which he was exposed. Moreover, as the horses learned to communicate with Krall, by way of ‘sign language’, the horses would sometimes make spontaneous comments. On one occasion, during a lengthy inquisition by Professor Claparède. Zarif suddenly stopped work and then tapped out the word, `tired’, followed by `pain in leg’. He had also told Krall when Hanschen was beaten by a groom. Scientists examining the horses formulated various types of tests in an attempt to prove these horses were being signalled, in some way, by Krall. Some tests involved blindfolding the horses, by tying sacks over their heads, and another by observing them in their stables through peep-holes, or behind barriers of different sorts that helped conceal the questioners. 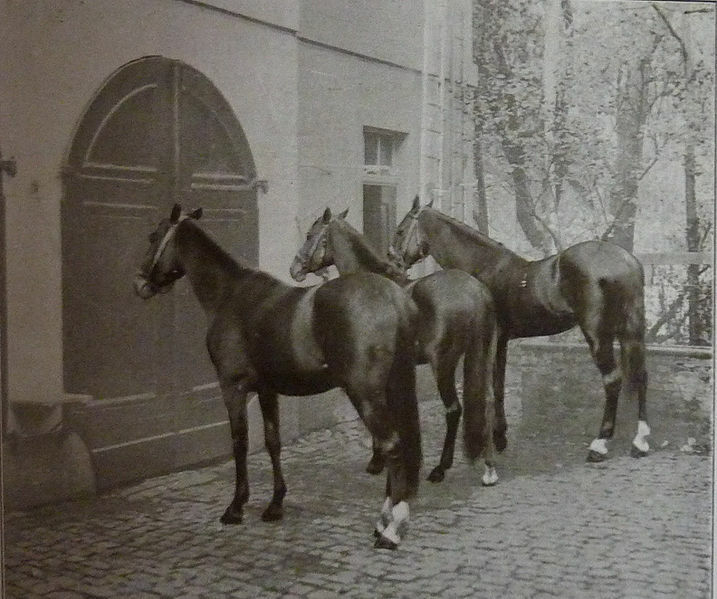 Dr Schoeller and Dr Gehrke reported a mind-bogging episode in their experiments with these horses between 1912 and 1913. They askedMuhamed why he did not attempt speech instead of pawing with his hoof: The animal appeared to try to articulate. Then he tapped out the sentence, `I have not a good voice.’ Dr Gehrke tried to show him how he must open his mouth before speaking, and Muhamed showed he understood by signalling, `Open mouth’. Zarif was then asked how he communicated with Muhamed. `With mouth’, he replied. `Why do you not tell us that with your mouth, Zarif?‘ asked the scientists. `Because I have no voice’, signalled the stallion. “It is very evident that any general principle of biology does not prevent us from admitting that an animal like the horse can possess certain intellectual aptitudes of a much higher grade than those which he naturally makes manifest”. All of Krall’s horses were requisitioned during the world war that shortly followed, and died in the battlefields. Russell, C. et als (1904). “The Thinking Horse”. Notes and Queries: A Medium of Intercommunication for Literary Men, General Readers, etc. Vol. 10:2. London: John C. Francis. pp. 165–166, 281–292. Phipson, E. (1883). “Marocco”. The Animal-lore of Shakspeare’s Time: Including Quadrupeds, Birds, Reptiles, Fish and Insects. London: Kegan Paul, Trench & Co. pp. 109–111.